On Baseball & The Reds: Redleg Nation asks: Should the NL adopt the DH? Redleg Nation asks: Should the NL adopt the DH? during his career if they had a DH? Yeah, maybe. Today, Redleg Nation ran a post asking its various contributors to weigh in on the question of whether the National League should adopt the Designated Hitter. This isn't something imminent, but I think everyone realizes that with offense down, this could well become one of the strategies that baseball adopts to increase its run environment. When a pitcher is due up in the next inning, managers may be less likely to remove them mid-inning to set up a more favorable match-up. This is an interesting decision, and might help prevent mid-inning pitching changes (which, in turn, might speed up games). When a pitcher is throwing well but a team needs offense, there is an equally-interesting decision to be made about whether to pinch hit for him. Double-switches are a fun, and have the consequence of removing a regular from a game in favor of a bench player. The necessity of having at least a few pinch hitter appearances in most games guarantees bench players will get into games more often. Like it or not, pitchers are just not good at hitting. In fact, one can use pitcher offense as a measure of league quality. They aren't trained to do it, and it's not fun to watch them hit. It doesn't happen often, but sometimes pitchers get hurt hitting or running the bases. To cut down on injury risk, they are not even encouraged to run with maximum effort. Again, not fun to watch. The DH means fewer sacrifice bunts. The DH allows for some small amount of specialization to improve the quality of play: offensive lineups get better because bad-fielding hitters can still play, and defense gets better because bad-fielding hitters don't have to field. The DH allows hitters to get rest without actually taking a full game off. Similarly, it sometimes allows players with a minor injuries to still play. This should mean that fans get to see their favorite players in games more often. 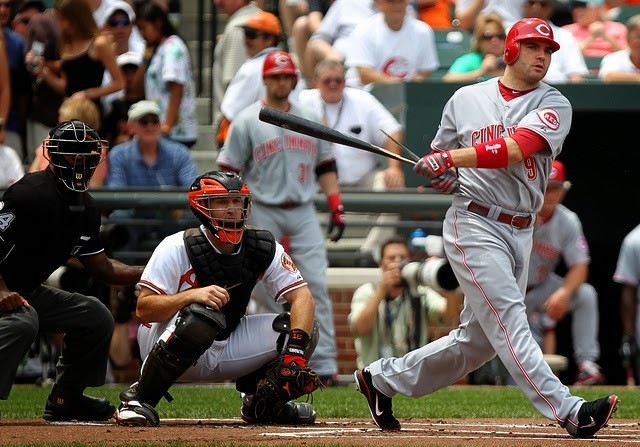 Would Joey Votto have been able to play more last year if the Reds could use the DH? I'm not sure, but maybe. Fewer pitchers should be needed per game because managers are not forced to pinch hit for a pitcher. This should help keep bullpens more rested, and makes it easier for managers to get the match-ups they want in late innings. It means that player performances decide games, not the machinations of managers. That's what this game is all about. So, there you have it. Bring on the DH. I'm finally converted.